One in four Brits have bought a product as a direct result of social influencer recommendations - but 42 per cent called for content providers to curb the fake news and offensive opinions, according to research from Golin. The research — conducted on behalf of Golin by Toluna among 1,500 consumers aged 21-60 years old — found British consumers are not put off by sponsored posts by content producers, with one in five keen to be on the receiving end of product recommendations. Nearly a third (31 per cent) of consumers said they understood the need for influencers to make money, 25 per cent felt that sponsored content was fine so long as it was well balanced, and 20 per cent actively liked it when influencers recommended products. So-called 'real-life' influencers were three times more likely to engage consumers than celebrities and journalists. Influencers, who range from YouTubers recommending video games to bloggers promoting beauty products, appeal to consumers for a variety of reasons, the report said. 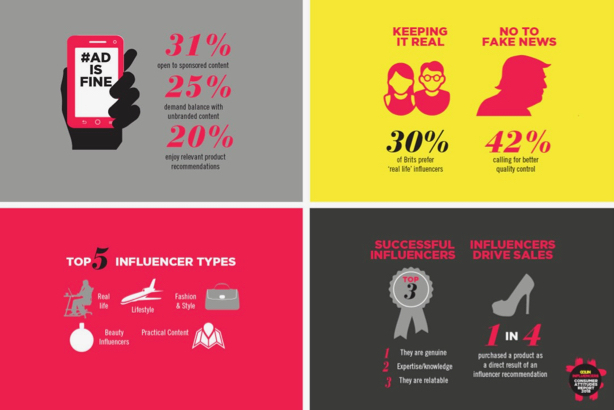 The top three traits that entice consumers are influencers who are genuine, who have real expertise and who are relatable. But 42 per cent of consumers expressed concerns about insidious troll culture, sending a clear signal to brands and influencers who ignore fake news and potentially offensive content. The point backs research reported by PRWeek earlier this year that found a lack of regulations around influencer marketing was damaging for society. Will Cooke, Golin's executive director of strategy and innovations, said: "Many brands still consider follower numbers to be a key metric for their influencer marketing programmes, however it’s increasingly evident that consumers are far less engaged or indeed prompted to purchase by influencers with massive reach. "Instead they favour ‘real life’ and honest influencers, or those who are relevant to their lives and values. The most important thing to UK influencer audiences is honest experience, it’s no longer about polish and false perfection."